Whitland is a small town situated approximately 15 miles from Carmarthen. The town borders the river Taf, and the county of Pembrokeshire. The Taf can be fished with a permit, available locally. Whitland is fortunate to have its own railway station right in the town, with direct links to London, and the north, as well as local services. Whitland has 2 thriving schools, Post Office, bank, shops, businesses, 3 pubs, cafe, and a restaurant just outside the town. Whitland also has the well known Hywel Dda interpretive centre, and just outside the town is Whitland Abbey, which can be seen by using the many footpaths that surround Whitland, especially the famous Landsker line. Whitland town hall is a registered charity, number 504650. It is conveniently situated near to a railway station, close to the A40 and with ample parking facilities. It is suitable for conferences and meetings as it has a large main hall and other smaller spaces for hire per hour. It has IT, internet, printing and copying facilities for conferences, meetings and video conferencing. The Hall was built in 1904. The ground floor was at some point let to a co-operative society and then a butcher, and in 1950 the top floor became a cinema, The Coloseum, and the rest of the building a staff and social club. 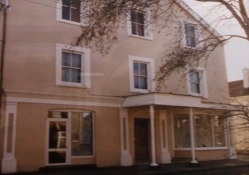 In 1973 the Hall was passed to the people of Whitland, and in 1992 extension and extensive renovation was carried out, leading to the Hall that is seen today. The hall is ideal for holding Receptions, Parties, Dinners, Conferences and Exhibitions. Free car park at rear with approximately 80 parking spaces. • Hall and kitchen, including tea and coffee making facilities: £12.50 per hour. • Mayor's parlour: £10.00 per hour. 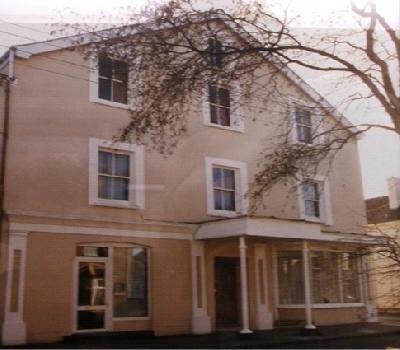 • Hall, plus full use of kitchen/catering facilities: £90.00 plus £20.00 returnable deposit. Very large room upstairs, nice wooden floor, plain decor (magnolia) 30 tables, 200 chairs (in good condition), sound system, ample plug sockets & break-out areas. Catering kitchen (just off the large room). Outside caterers can use this kitchen which meets all the relevant st&ards or buffets can be ordered in. Good local caterers in the main street, 2 minutes walking distance that will cater for all types of meals in the hall. Meets all health & safety st&ards, well marked fire exits etc. Railway station within 2 minutes walking distance. From the A40, take the Whitland turn off at the Llanboidy Road roundabout overlooked by The Roadhouse Restaurant. Proceed down Spring Gardens to the bottom of the hill, just before the belisha crossing, turn left into Saint John Street, then next right into King Edward Street, and the main entrance to Whitland Town Hall will be on your left. From the train station, walk up Saint John Street, until you come to King Edward Street on the left, turn into King Edward Street, and the main entrance to Whitland Town hall will be on your left. The disabled and side entrance is accessed from the car park.